We have spent the last few weeks working on Lucas’ new bedroom and it is nearly finished. Just a few pictures to hang, a new shelf to go up and it will be done. I’m hoping to be able to share some pictures of it in the next couple of weeks as I’m so happy with how it has turned out. Considering it is a tiny space we’ve managed to make it bright and exciting for a four year old, even if he is still upset about where I have put the world map! The next step is the twins bedroom, this one I think will take us a little longer to get right. The room is a fairly decent size, in fact I think it is bigger that our bedroom but figuring out a layout that works is tricky when we have to fit two beds in. As it is the larger bedroom upstairs it would be nice to keep some floor space for them all to play up there. They are still in cots at the moment but they are getting a little small and they keep on crawling into Lucas’ bed and getting cosy under the covers. They are ready to make the move into children’s beds and their room is desperate to be decorated. When we first moved in Lucas was 10 months so we didn’t do much to it, then when we found out we were having twins we knew he would have to move into the smaller room so we decorated that for him. Since then we still haven’t done anything to the twins room; it is still beige with all sorts of random furniture in and old baby things we need to clear out. I still can’t decide exactly what I want to do with it but I’ve picked some things out that I like the look of just to get the ball rolling. I’ve been pinning pictures of shared rooms for quite a while and one of my favourite pins has these beds and shelves in from House of Fraser. I love the bright colours and that you can get them in different shades to mix and match for a shared room. I also love the idea of the twins having their own shelves and storage. They share so much it would be nice to them to have something to keep put their own treasures on. I like the idea of having them above each bed and it is always good to have some wall storage. The storage baskets are also from there just because I loved the colours, I think they’d look cute at the bottom of each bed. The bedding is from Ikea and I look at this design everytime I’m in the shop. I always like how their bedding is something different and I know my car mad boys would love this one. Lucas had something similar and the white background helps to lighten everything in the room. I’ve actually already bought a ‘L’ letter cushion for Lucas’ room and it looks fantastic. These cushions are only little so perfect for popping on a child’s bed (or amongst the mountain of teddies in Lucas’ case) and since I’ve already got one it only seems fair that the twins should have their own too. I don’t want them to have everything the same but I still want it co-ordinated so trying to find things that match but aren’t exactly alike is the most difficult part. I still want them to feel like they have their own space in a shared room but I’ll enjoy doing this one before they have too much of an input! I love those shelves and beds! They’ve got a really cool retro feel that you don’t tend to see often in kids furniture. Love the monogrammed cushions too – so cute and a really nice way to get them learning to spell their name! That’s a good point, I hadn’t thought of that, will definitely have to get the cushions now then! Oh I hope they like it, I just think it’s nice for them to have things that are just their’s rather than being exactly the same! Those letter cushions are awesome! I actually spotted them in the shop the other week and it was only a glare from Paul which stopped me buying them. I love a bit of colour despite being a huge fan of grey, black and white … orange is my fave though as opposed to yellow, but the shelves are lovely! Oh I just ordered the cushions online so I was made up when they came and were as lovely as I had hoped! I like your splashes of colour in the pictures of your home, always looks so cheerful! The yellow furniture is gorgeous. One of my favourite colours for a nursery! Especially against the monochrome of the letter cushions. This is going to be such a cute room, I can feel it! Thank you, I think yellow is always a lovely colour to decorate in too, so cheerful! I love the beds that you chosen. I think it’s a great idea that the twins will have similar/coordinating but not identical beds/shelves etc. The bedding is cute too. We have Ikea bedding in the girls room and it has lasted well with what they throw at it! Same here, my eldest had some Ikea bedding and you just can’t go wrong! The cushions are fab aren’t they, a few places do them now I think but I like these mini size ones! I love it all Hayley – in fact I need to follow you on Pinterest as I like ya style! I think those things would be great for any siblings sharing too as they are so versatile. 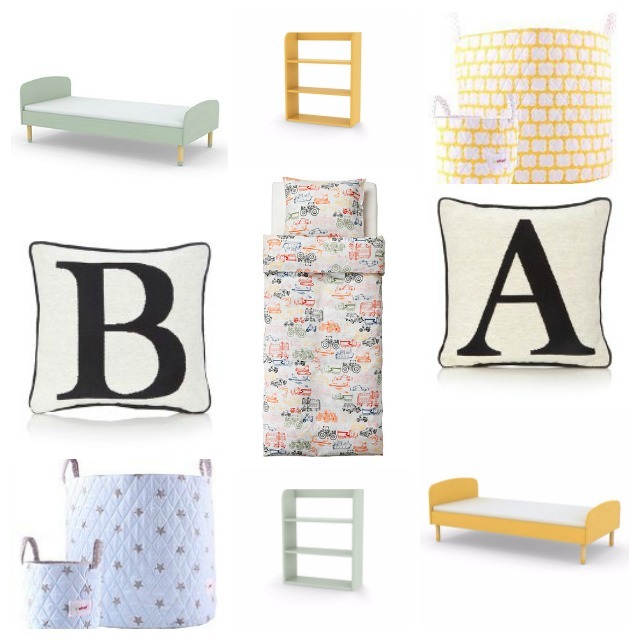 I do like those letter cushions! A great selection you’ve chosen there overall, though!